Trowel to Table | A blog about growing your own…and eating it! 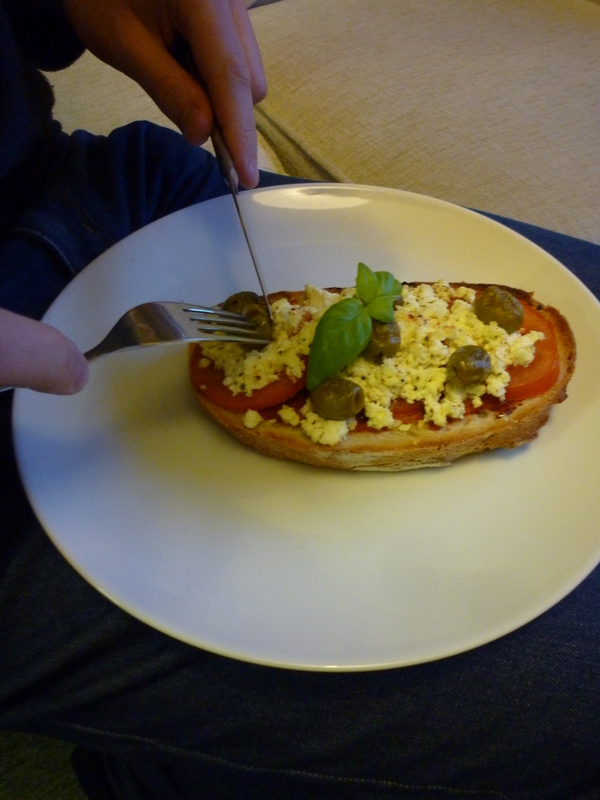 A blog about growing your own…and eating it! One piece of toblerone. How cruel of husband to eat his Christmas bar of toblerone and then mine right next to me over the past 20 evenings…harsh. So I ate a piece after a very tiring day. Quavers- again husbands fault, who buys a six pack and then leaves them on the counter? Rhubarb and Custard Organic Yogurt- damn you yeo valley, just damn you for being so tasty. Anyway I’m back on the wagon, although I think those teeny slips only count as a slouch towards the edge of the wagon, not full blown falling off. Everything else I have consumed over the past 20 days has been 100% vegan. I don’t think there’s enough room in this post to go through all my meals and exercise so far over the past two weeks, but I can tell you I’ve been eating a lot of fake meat, pulses, nuts, peanut butter, vegetable stews, wraps, salads, Mexican food (beans, rice and avocado), couscous and vegetarian sushi- all of it has been proper lush, and I feel great! Last Thursday James and I got our visas approved at the US embassy in London, here we come San Francisco! 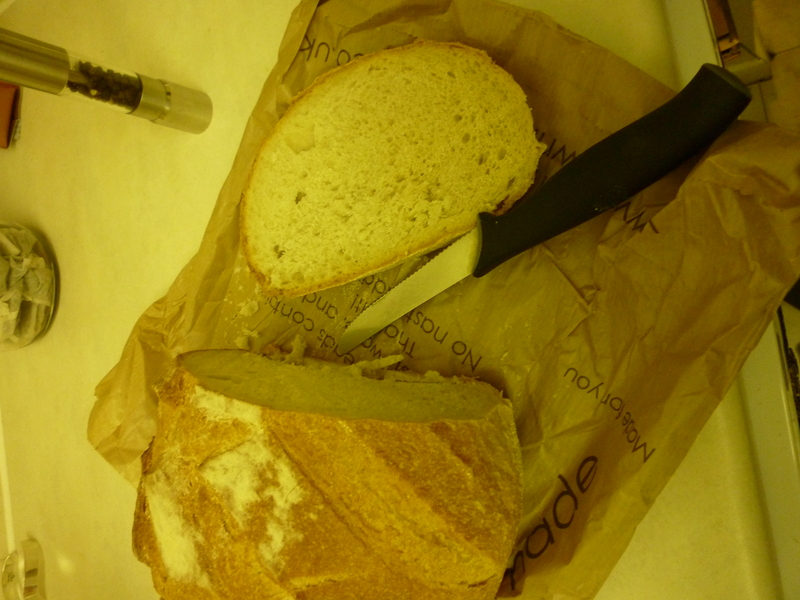 To celebrate we had brunch at Le Pain Quotidien in London. I was so grateful for their great vegan options, there were LOADS. I had a matcha green tea almond milk latte, followed by their vegan version of their mushrooms on toast (with mustard and soy cream instead of crème fraiche), finished with their vegan chocolate and pear cake- so easy and affordable, a great vegan option. This orange chocolate from the Co-op is vegan despite having only 56% cocoa solids, which means you can basically enjoy a chocolate orange rather than end up with a bitter taste in your mouth. I like nut milks but will definitely be keeping this one on after veganuary. I love hazelnut milk, I cannot get enough. In my breakfast protein shake with some protein powder and a shot of espresso, or in tea (surprisingly amazing in lady grey). Who knew?! Win! Combined with Hazelnut milk (double win). This goes down alongside frazzles, chocolate frosting and fry’s chocolate cream as surprisingly vegan. More amazing stuff you never knew was vegan! Veganuary End of Week 1! 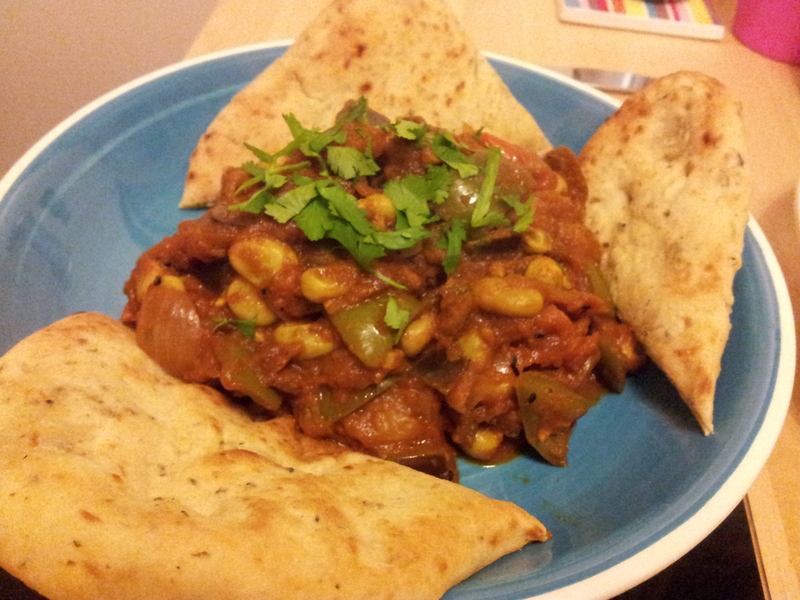 So Veganuary Week 1 is almost over, it’s the end of Day 7! So, so far it’s been OK. I’ve been rumbled at work so have had to deal with the “are you mad?” and “what about protein? !” conversations, and they weren’t too bad. I’ve had a few moments staring at other people’s cheese in the fridge and left over Christmas chocolates, but not too many! You know what has helped so far? A surprising treat, a present from hubby, a package of Marron Glace! These are sugared chestnuts, containing just sugar and chestnuts. So delicious, a real treat to help get over the chocolate cravings. Garden of Life Raw Protein. It says it’s “Beyond Organic!!! !” BEYOND organic. I mean that’s some kind of off the scale vegan-y goodness right? I bought it before Veganuary worried about my protein intake over the month having given up dairy and eggs. But today I wondered, is this stuff any good and will this actually be good for me to drink? So I looked into it and here’s the basics I’ve found about protein. So if you eat the right amounts of these foods the protein you get is no different from meat. What are the right amounts? Well there’s some differing opinions on that, but most settle around 0.8g per kilo of body weight or 0.35g per pound. The NHS recommends around 50g a day for a healthy adult. An interactive DRI tool from USDA gives you an American measure, mine comes out at 46g so similar to the NHS recommendation. So how does my shake shape up? Well it contains 17g of complete protein per 90 calorie serving, from a lot of the complete protein sources listed in the compilation above- rice, beans, chia & buckwheat. So at least it does what it says on the tin- and it tastes OK (the texture is like trying to swallow chalk, but it tastes OK). No Cheese For a Month?! So Christmas is over and 2016 has begun! We’ve had a fantastic Christmas down in Devon full of all sorts of lovely indulgent tuck- chocolate, cheese, yule log, pies and puds…nom nom nom and now is the new year and the time of year when you look down and realise your belly is a little bit larger than usual and you feel a little bit more sluggish and it might be time to make a change. We don’t eat a ton of animal products, we’re both veggie and like to be quite healthy in what we eat so do’t eat a lot of dairy and eggs, but over the winter work has got busy and our consumption of easy treats- mainly chocolate and cheese- has gone up. We have a whole cupboard full of chocolate treats! This makes me feel a bit guilty, not only about the health implications, but also because of a lack of appreciation of products which animals don’t enjoy making for me to eat. To take a break and appreciate these products a little more, and to kickstart a healthy year, I’m going Vegan for a month as part of Veganuary! At this point I’m not considering vegan long term but want to kick start a healthy appreciation of food without animal products to take into the rest of the year. So to hold myself to account, I’m going to write a couple of blogs about what I’ve been munching on and whether I have been jumping up and down like an idiot for 8 minutes on schooldays. Early Dinner: Stir Fry with soy chicken, green beans, edamame beans, shredded veg, beansprouts, garlic, lime and soy sauce, served with Udon Noodles and topped with chilli seeds. Making Sloe Gin Christmas Presents! This year we decided to make homemade christmas presents for our friends and family, and what better present than a slurpalicious batch of sloe gin. If you are reading this blog you may have received a bottle from us and we hope you enjoy it. I’d like to tell you a little more about making sloe gin. The first step of which is picking the sloes. These are in fact the sloes we picked for your gin, near our house in the village of Histon. We waited for the sloes to ripen when they give a little to the touch and then hit the trees for collection time. Overall we picked about 4 kgs of sloes. Here they are below, carefully washed and destalked by James! Then we needed to freeze them to rupture the fruit. So, off they popped into the freezer in freezer bags, after carefully being weighed. We decided to use the Sipsmith recommended method of making Sloe gin. Which instead of adding sugar at the start calls for just adding the gin to the sloes and then sweetening to the exact sweetness called for later with a sugar syrup (made of sugar and as little water as possible to dissolve it, and keep it dissolved, at room temperature). We found this to be a great method, as when tasting the gin later we found you could easily oversweeten it. Also apparently it allows the natural fruit sugars to emerge first, which happens less when exposed to non-fruit sugar, or some rubbish like that which sounded important at the time. So after the sloes had ruptured, time to add gin! Then it was time to add sugar syrup to make it an optimum sweetness, then bottle it! First we needed to strain out all the sloes and the little bits of sloe jelly they make after bursting and mixing with the alcohol. We used a funnel with a piece of butter muslin and strained the gins into the original gin bottles. We saved the alcohol soaked berries to make “slider” later, by adding Cider to the gin soaked sloes to make a flavoured, fortified, Cider drink. Yeah I guess that was me! You can see the sugar syrup in a pan in the photo above. This was made up of about 1.5 parts sugar to 1 part water. We then added it little by little to a test batch of the sloe gin called “number 1” we thought we’d hit on the perfect ratio of sugar syrup to get the right sweetness being 17%. Later we found our calculations were a little bit off, perhaps from all the “tasting” and the next day we proclaimed the perfect sweetness to be somewhere between 15 and 16% sugar syrup. When bottling them up for presents (into new shiny bottles with corks we bought on amazon) we mixed the batches together, but kept the ratios different, so each bottle will have a unique taste and sweetness. Present Receivers: If you would like to make your sloe gin sweeter then just mix 1 part sugar to 1 part water and heat gently, add a little of this syrup to your sloe gin and bob’s your uncle! But be careful, it’s easy to make it too sweet!!! The final product was ready! Now to make the labels to decorate them! So the only thing left to do now is enjoy! MERRY CHRISTMAS EVERYONE! So, erm, I’m a little hungover today and everyone knows the cure for the night before- Vitamin C (or a fry up, but we’re going with Vitamin C for this post). Which we have a lot of in the garden in the form of our tomatoes- now ready to Harvest! So, when I managed to drag myself out of bed (after many cups of tea) I headed into the garden to cheer myself up with some tomato picking. 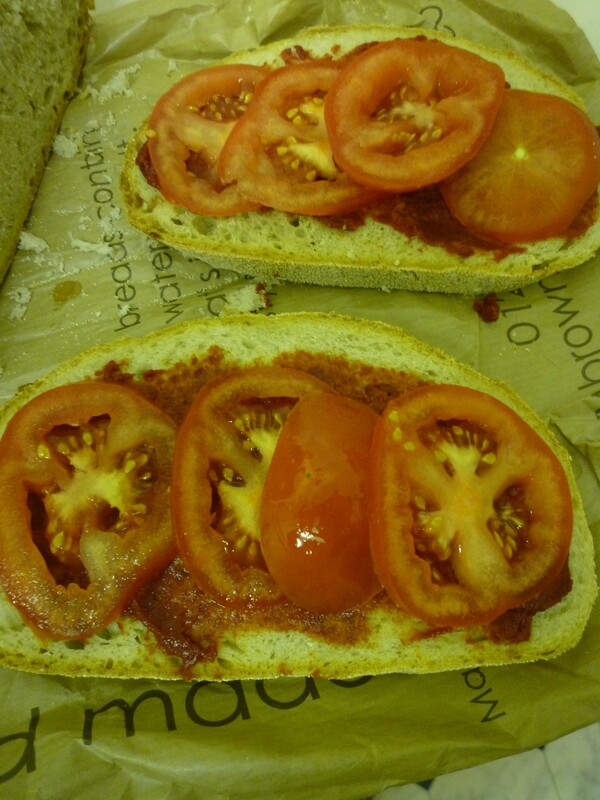 The fruits were so pretty I had to grab my camera and then thought I’d do a little blog on best/worst tomato varieties. We went mad this year we planted LOADS of different varieties- Ildi, Yellow Pear, Sungold, Lucciolo, VF Roma, Super Marmande, MicroTom, Ailsa Craig, Black Krim, Black Cherry, Black Prince, Sweet n Neat- Yellow, Totem, Outdoor Girl, Tigerella, Golden Sunrise, Cherrola and Ace. A lot of them are still green on the vines but thanks to the hot and wet weather loads are ready to be gathered…into my face! So I’m not great at labelling and I can’t tell which is which in the garden, but all the yellow pear-shaped tomatoes are blooming lovely, despite their lemon-like appearance are actually very sweet and thin skinned- a fantastic salad tomato and a prolific cropper! Really nice big square-ish plum tomatoes, a very nice crop and no blemishes at all on the skins, fantastically sweet when cooked. Gorgeous colour, sweet taste, hope we have some still around at Halloween! A friend helping protect the black cherries! A really short plant that practically supports itself, with nice even sized fruit. Great for the edge of raised beds! 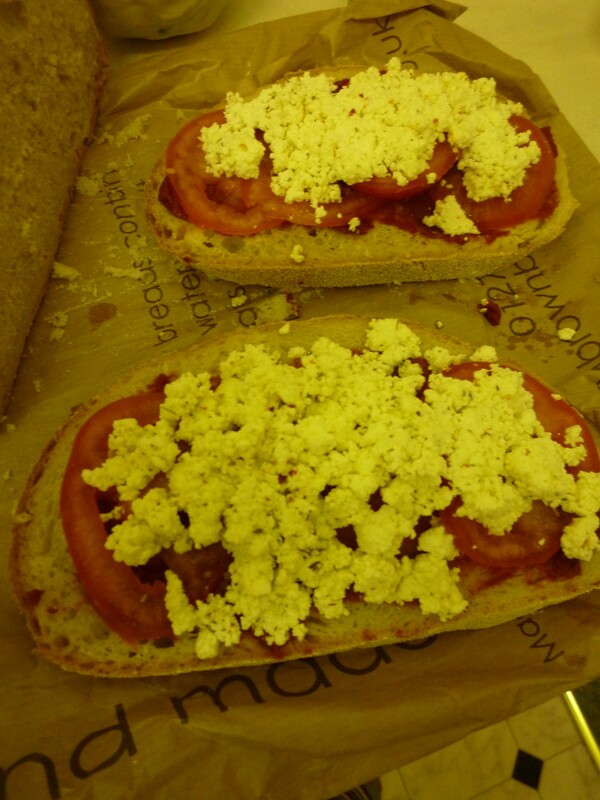 Why do I not have mozarella in the house? I can’t believe it’s been over a year since I last posted, what a crying shame! So since last time we’ve let our allotment go to a new home, as we’ve moved into our first house together (just before the crazy market explosion and house price inflation….phewwffhh!) A little one bedroom place in the village of Impington. We now have a little garden of our own and a beautiful conservatory which has proven fantastic already for germinating seeds, and cultivating our chilli plants and our new olive tree- Oliver! 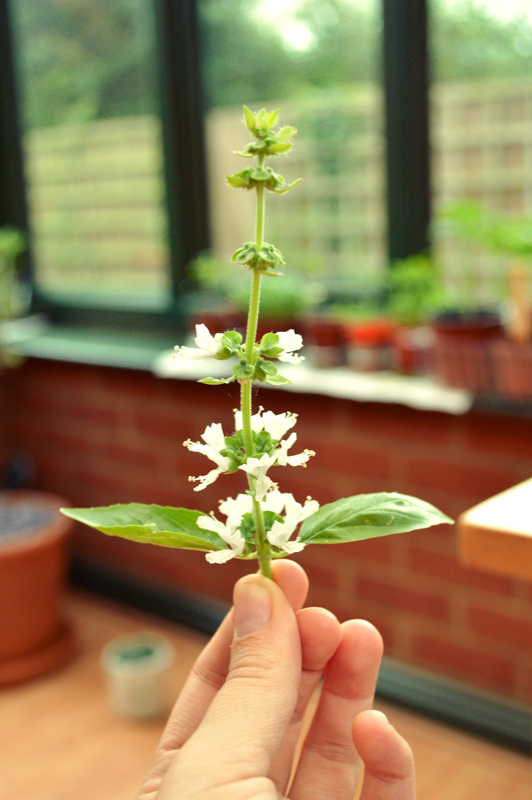 We had a huge basil plant in the conservatory that recently flowered, sadly that marked it’s decline, but when it did flower, to prevent the plant from going leggy and bitter I lopped the flowers off…but what to do with them? Online folks were eating them on salads or adding them to vinegar, but I decided to add mine to oil to make a pretty and fragrant olive oil. A month later, and the oil tastes great. I also added rosemary, a chilli (from our plant Ramon) and some peppercorns. A great way to use up flowering herbs! 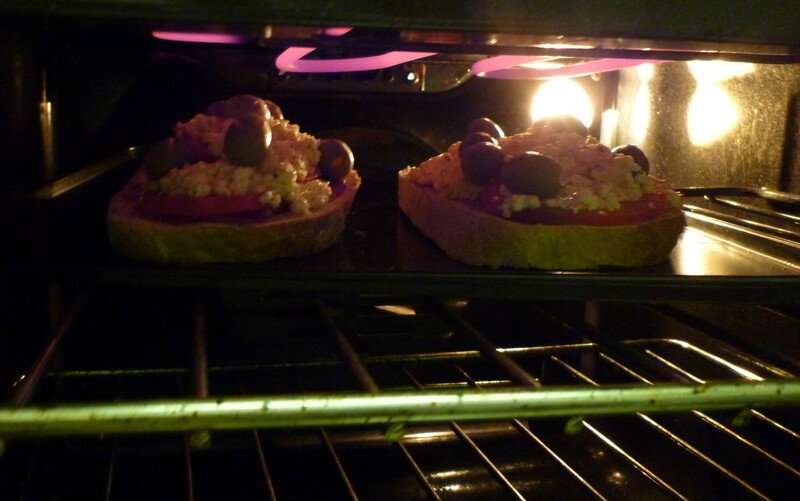 Make your own organic cheese, then put it on pizza toasts! 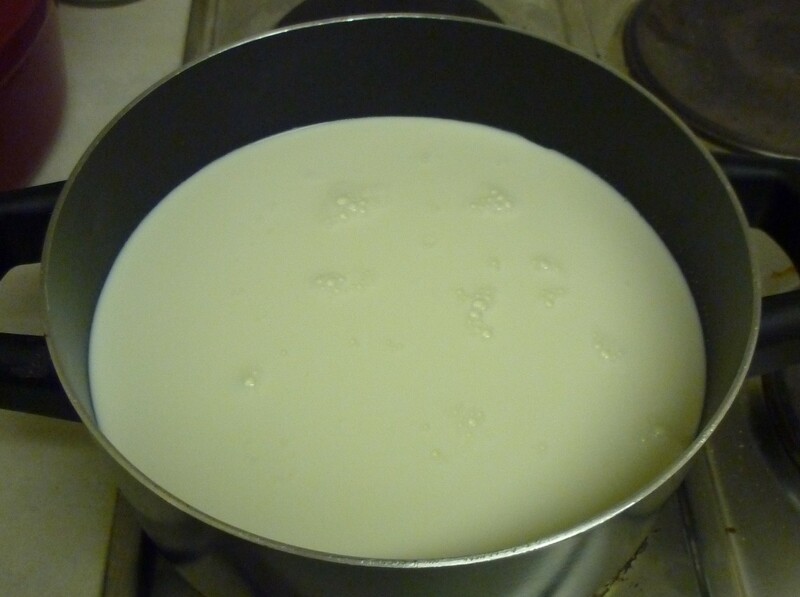 It’s really easy to make fresh cheese just with whole milk and lemon juice, a pan and a teatowel- that’s it! Follow my tutorial here to make the cheese, then before you hang it up to dry fully and shape it for cutting, nick some of the curds out to enjoy it straight away with these quick and easy pizza toasts. 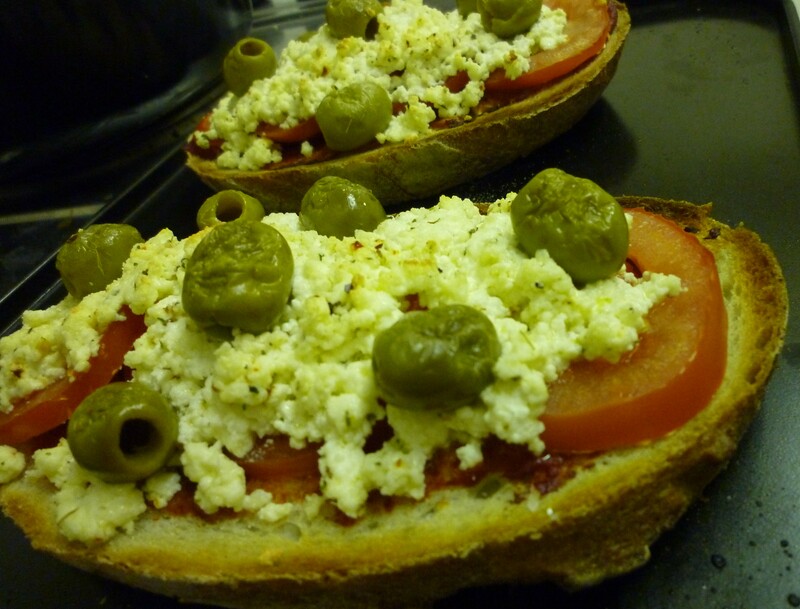 They’re made extra delicious with the rewarding feeling of having made the cheese yourself. 2. Spoon some into a bowl and mix with chilli flakes, herbs and olive oil. This is also great with chopped capers and lemon zest! 7. 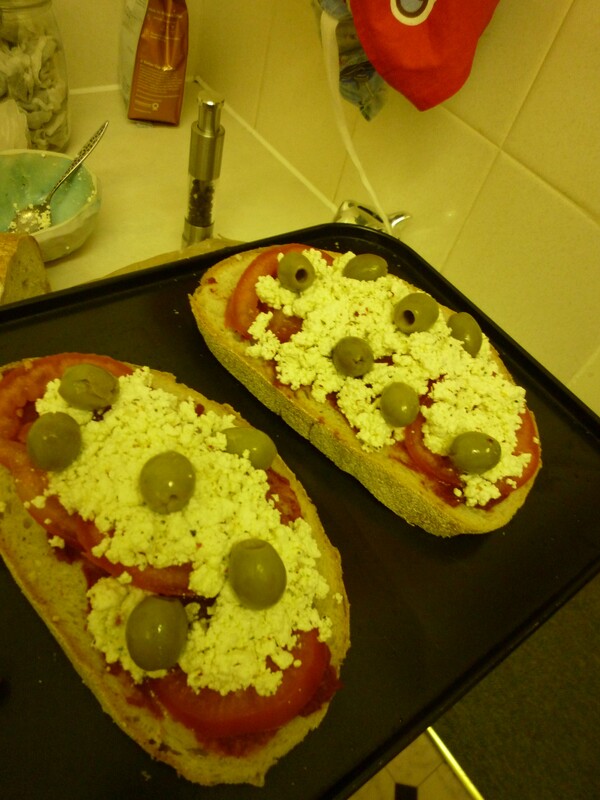 Add olives then place under a hot grill for a few minutes, the cheese won’t melt but the top of the bread will toast, the cheese will brown a little and the olives will smell devine. 8. 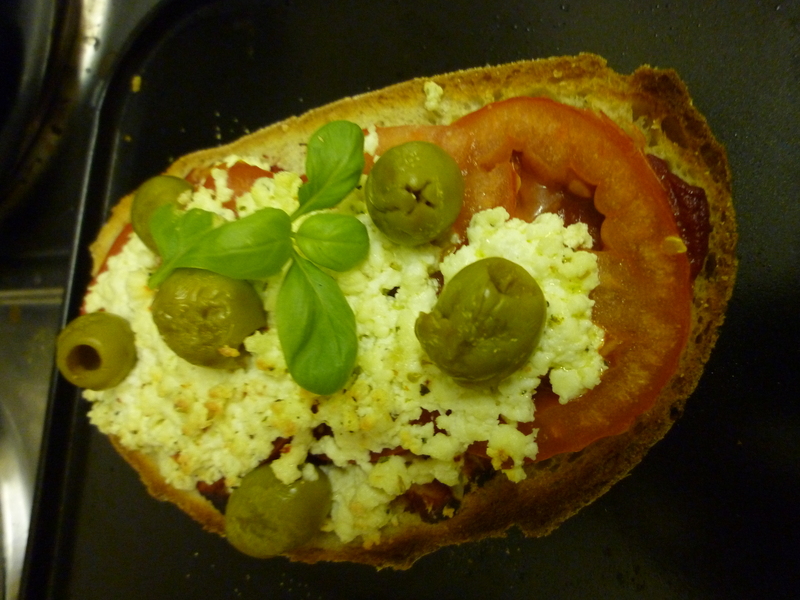 Add fresh basil and enjoy! 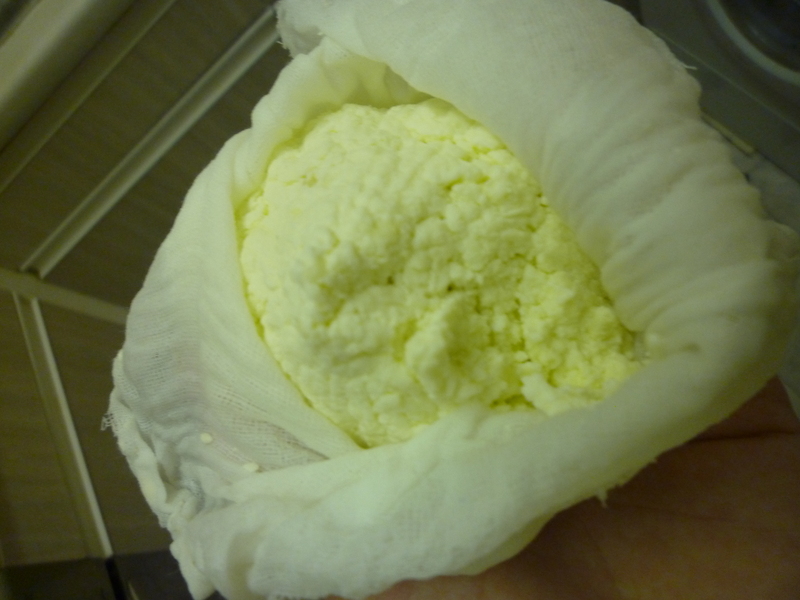 Today I made myself some cheese! This recipe is easy peasy, there’s no rennet, and you don’t need anything but fresh organic whole milk and something acidic (vinegar, lemon or lime juice). 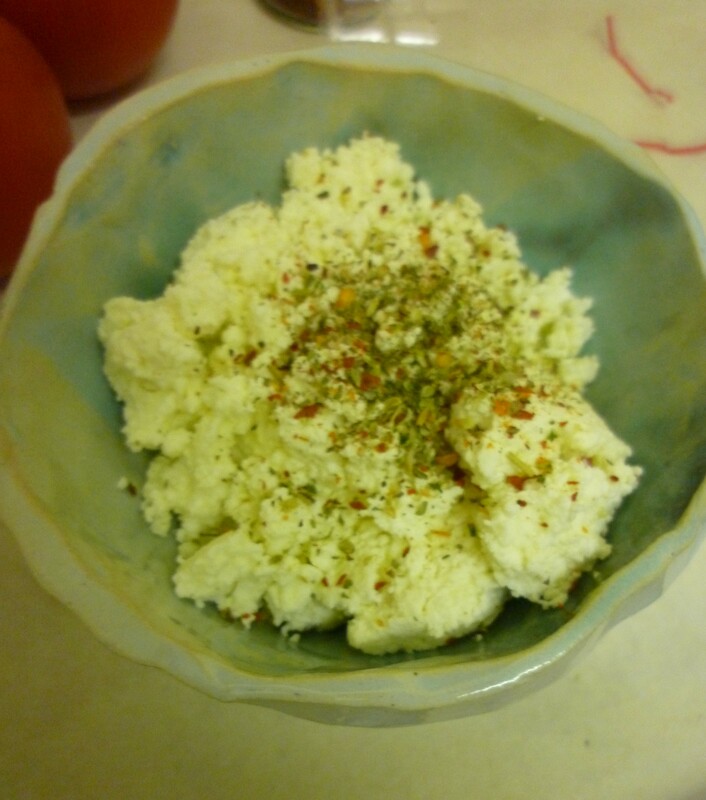 I set out to make Paneer, but stopped before shaping the cheese curds to enjoy some ricotta-like cheese with chilli flakes, herbs and olive oil. This Indian cheese (Paneer) isn’t mature or ‘cheesy’ tasting, it’s very plain and doesn’t melt, this is because with matured cheese, like cheddar, rennet is added which further breaks down the proteins in the curd, forming a single mass which matures over time and melts under heat. Paneer doesn’t include rennet (from India, this cheese can be consumed by the vegetarian hindu population of the country) so it doesn’t mature well and doesn’t melt. But it does make a great creamy fresh background for strong flavours like curry, chilli or oregano. 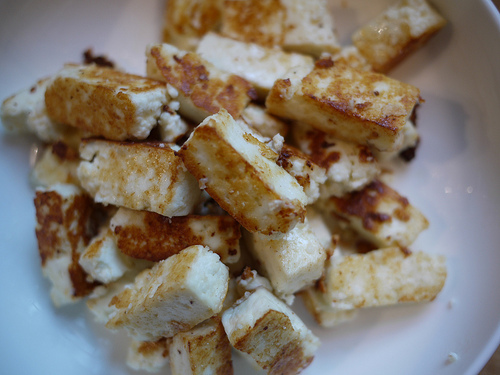 So what’s the advantage of making your own paneer? Well first of all it’s fun, secondly it’s cheap (4 pints of milk makes a good bit of paneer and at only £1.69 for 4 pints of organic wholemilk, I think it’s at least £1 cheaper than the same cheese in the shops), thirdly it means you can make your cheese organic- I’ve never seen organic paneer in the shops. 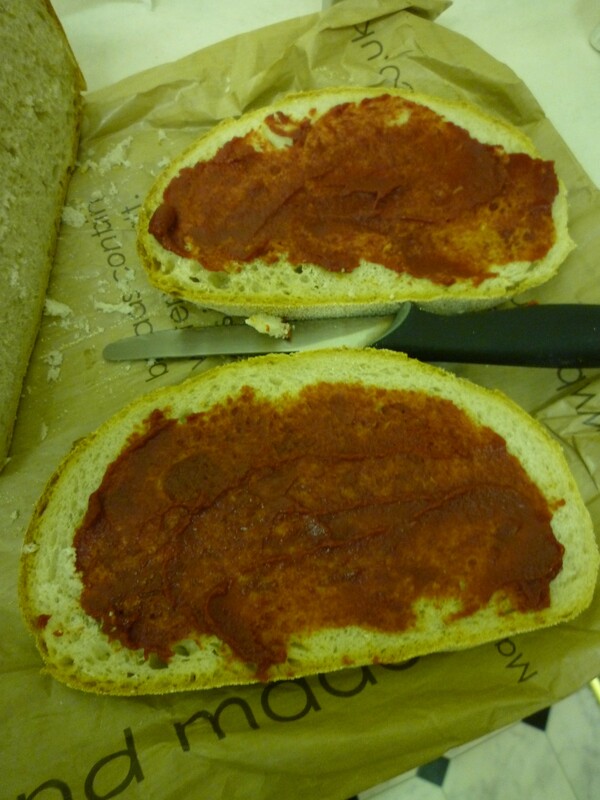 So here’s how you make it, AND how to use it straight away on tasty pizza slices! Between 100 and 140ml of acid (vinegar, lemon of lime juice- I recommend the most tasteless, so rice vinegar or similar is good). 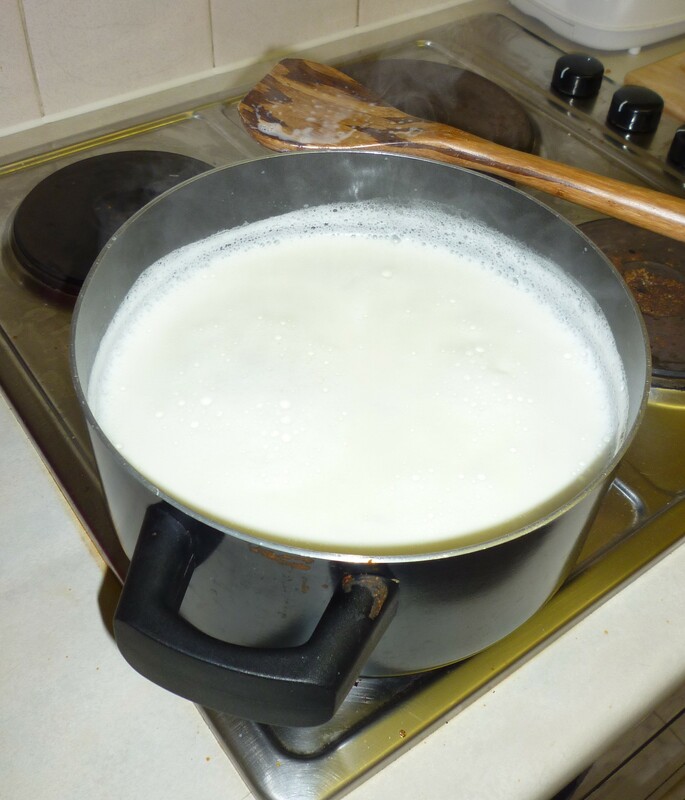 Heat the milk until boiling and then turn it down to a simmer. 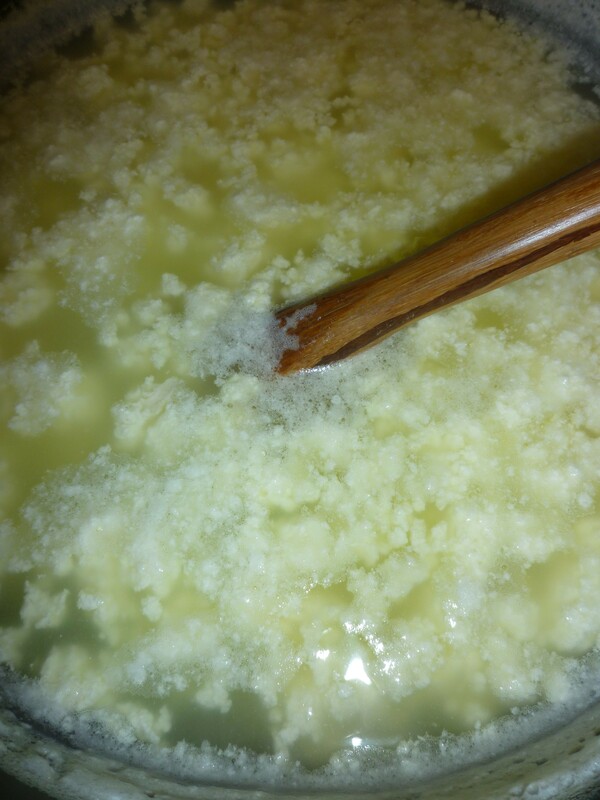 Add the lemon juice or vinegar, in small amounts until the white cheese curds split away from the green whey, don’t add more acid than you need to, just because you don’t want the strong lemony or vinegary flavour. It’s worth mentioning it looks gross at this point but don’t let you put that off. 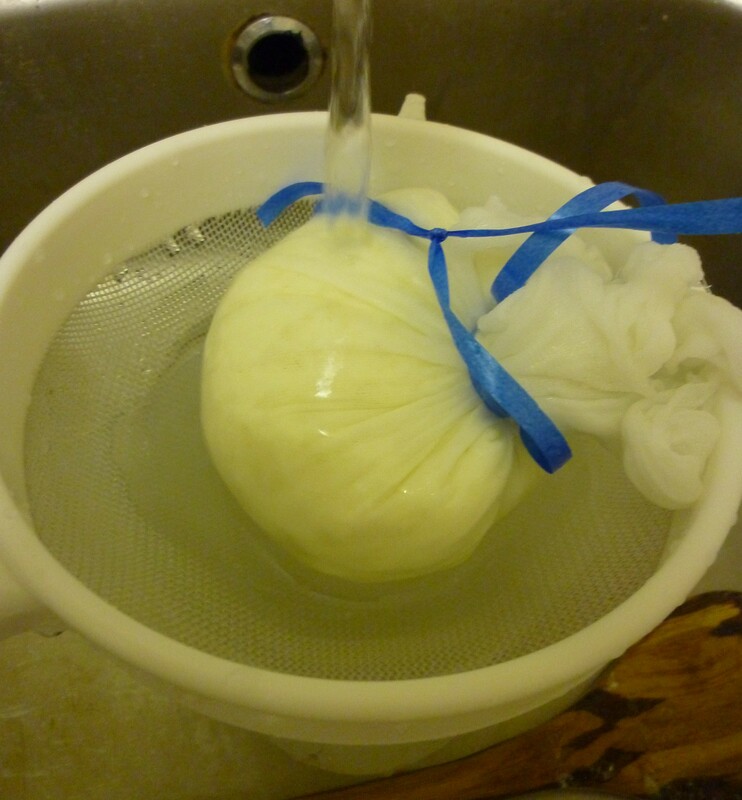 Rinse the cheese curds in the cheesecloth to get rid of any acidic flavour, then tie the cheese cloth into a parcel and rinse the cheese again, or soak the cheese in cold water, just to get all the lemon/lime/vinegar out. Squeeze the cheese again to get out as much liquid as possible. 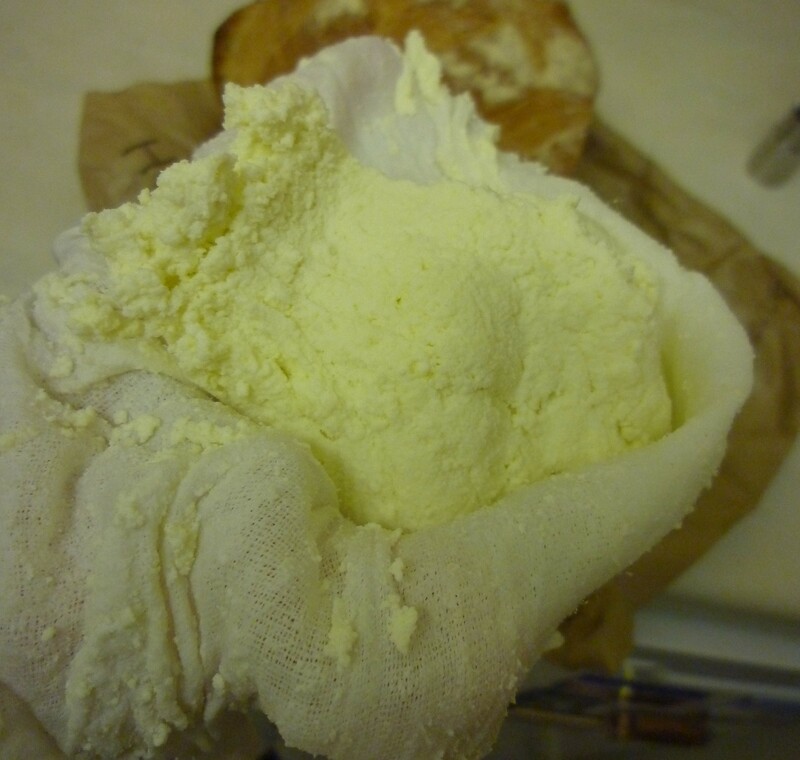 Now it should look like this, soft crumbly curds. At this point hang the cheese up to drip out the last of the liquid. 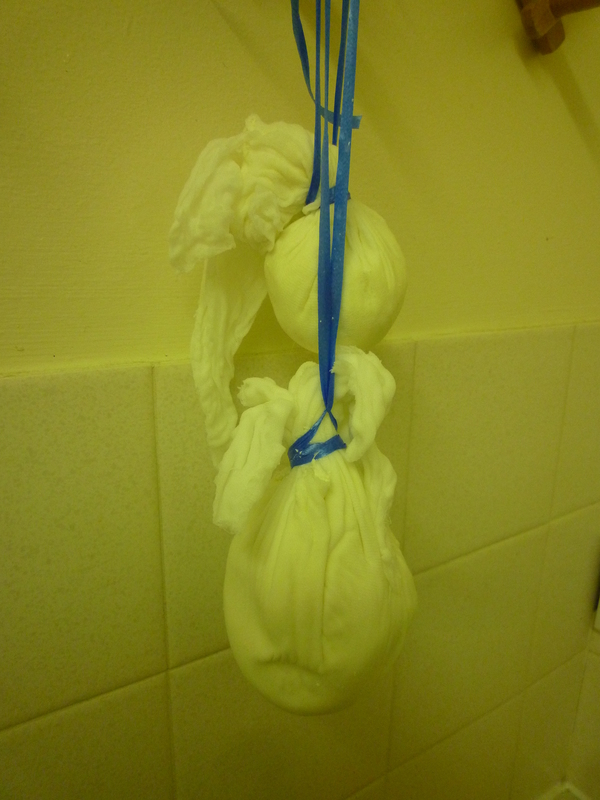 When the cheese has been hanging for a few hours and most of the moisture is gone, cut open the parcels, shape the cheesecloths with the curds inside into a block shape and wrap in more cheesecloth if available. 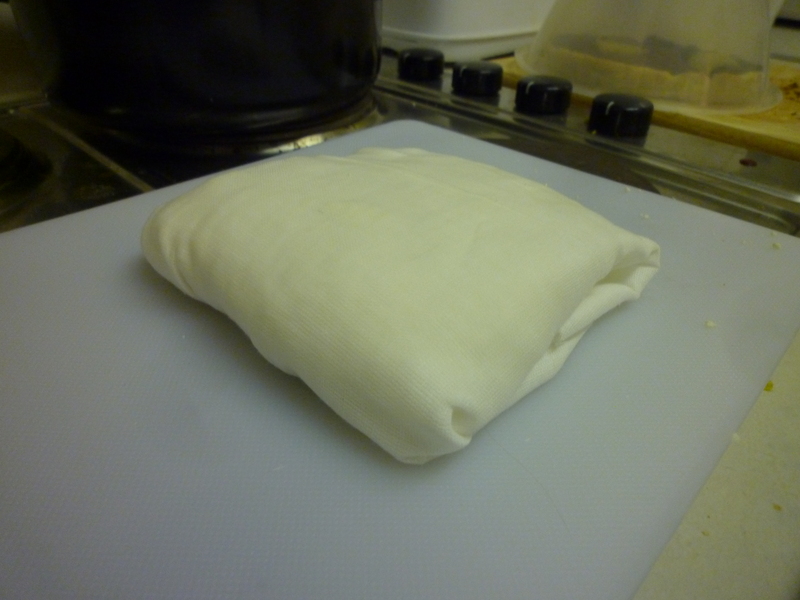 Then squash with something heavy to form the cheese into a block. 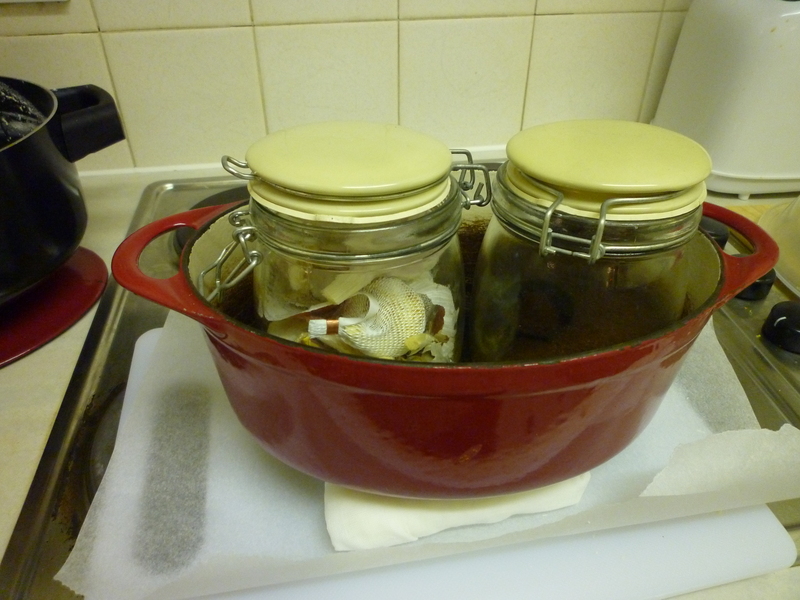 My version of something heavy- a cast iron pan filled with jars of garlic and coffee! 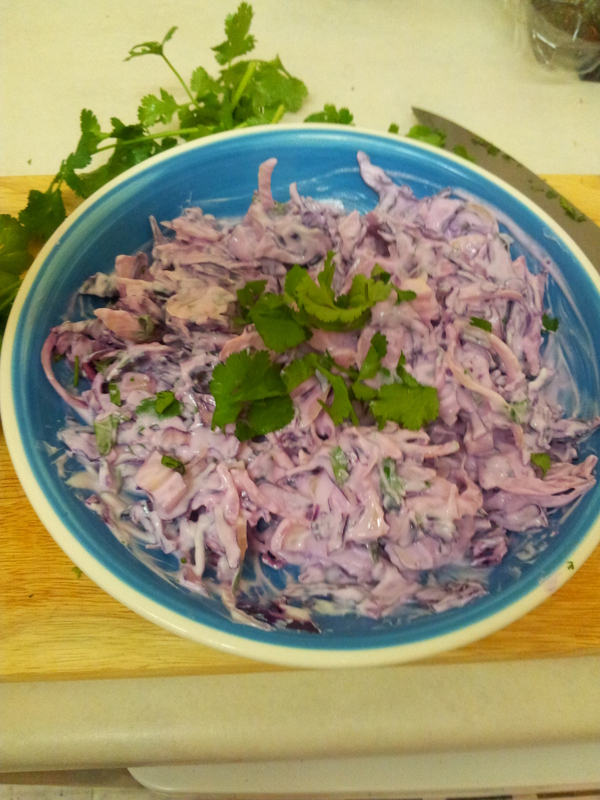 So Jamie Oliver made this as a coleslaw with finely grated mixed cabbages and mustard to have with bean burgers, I liked it so much I added more yogurt and made it a little chunkier to enjoy as a yogurty raita style accompaniment to have with curry. The amazing thing about this salad is the colour of it and the point where it changes colour…amazing. -1/4 of a large red cabbage finely sliced in the food processor (or by hand) or grated with a box grater for a finer texture. So you dice up the cabbage and onion, place in a bowl and squeeze the lemon over, you’ll see the cabbage turn from almost blue-purple to BRIGHT RED. 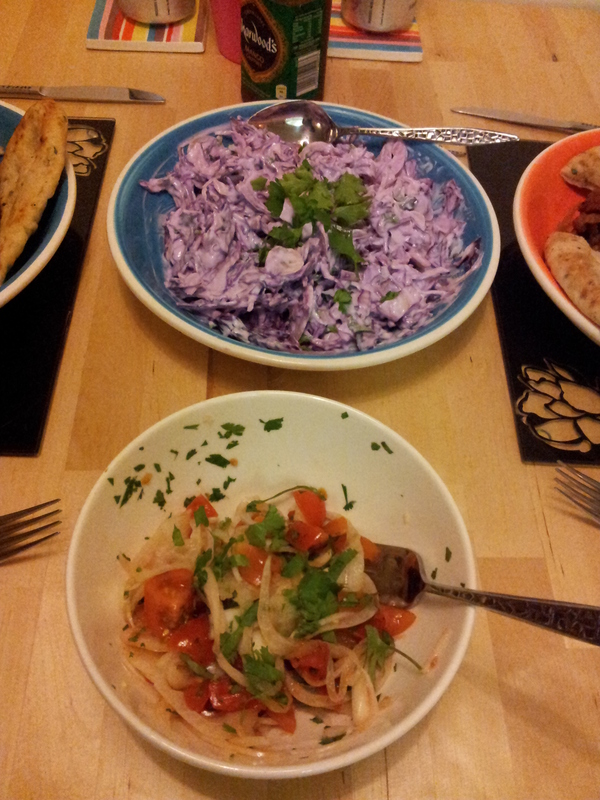 Red cabbage contains a natural litmus property which changes colour with different pHs, so this is pretty cool. Add yogurt to taste, more yogurty for Raita, less for slaw, mix in most of the coriander, mix together and then sprinkle the rest of the coriander on top. Voila! YUM! 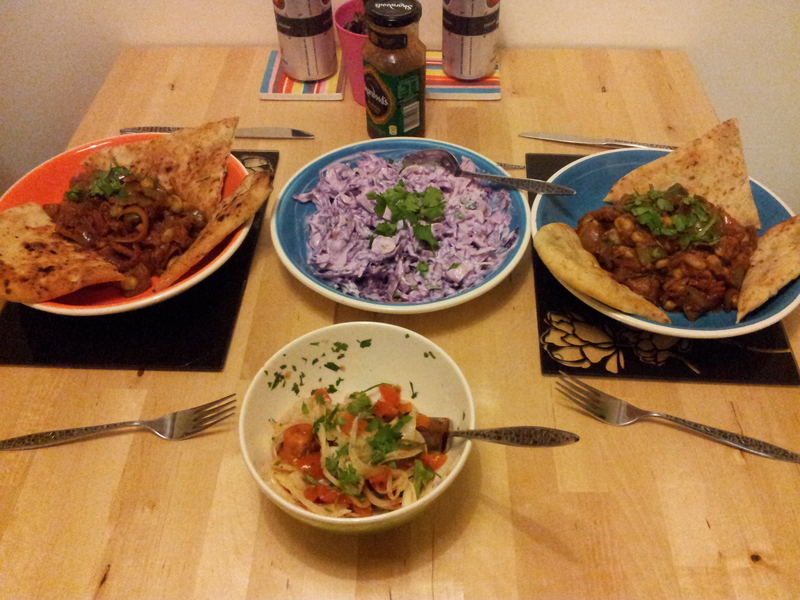 Cabbage Raita, Brinjal Bahji with broad beans, tomato and onion pickle and coriander naan- and two tins of stella!